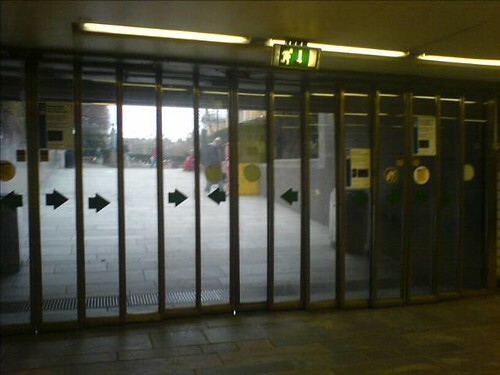 There are sliding doors into the underground station at Nationaltheateret in Oslo. Obviously, people got confused, walked into panels that did not open automatically, that did not function as doors. The wall of glass doors has a “false affordance”; parts of it look like they would open, but don’t. So someone decided to paint arrows to help people distinguish the door parts from the non-door parts. The arrows do not help. Some of the arrows have fallen off, making it even harder to figure out. A better solution would have been to put arrows only on the non-sliding parts, or better yet, add a half-tone or checkboard pattern to those parts instead of using an arrow. A clear window then indicates a doorway, while a translucent window indicates it functions as a wall. I enjoy this little dance with the doors nearly every day, because it reminds me of the first chapter in Don Norman’s book on Everyday Things. It features a glass-door trap as an example of poor design. Unlike the wall-size display that Tom Cruise used in Minority Report, this stuff is real. The cool thing here is that the user interface supports multiple touch-points, so that you can use both hands and multiple fingers to manipulate the objects on the screen. You can thus rotate an image by pinning a corner and dragging the other corner with your other hand. You can scale and object by dragging its corners further apart. The whole UI becomes much more interactive and manipulable, in a way that should make the whole UI a sort of simulated, cartoon reality. Like a cartoon, everything is squishy and stretchable. Randy Smith did some interesting UI work on this type of system via ARK (Alternate Reality Kit), but it was limited by having a single mouse pointer. Self is another system that would work well with this kind of GUI – the objects have a virtual physicality that lends itself to direct manipulation. One of the GUIs built on Self implemented the Disney laws of animation, so that windows bounce and deform much like Bugs Bunny would, rather than just appearing out of thin air. * why is everything in Norwegian all of a sudden? Did I miss something during Setup? * What happened to the title bar? Putting the menubar up there is cute, but not having a title bar freaks me out. The skinny look is different, but I kinda like it. The playlist used to lie on a larger slate window, but the slate padding is gone now. When you do a search, a set of little buttons appear at the top of the song-list. These buttons (All/Music/Audiobooks/Videos/Podcasts/etc) work as quick filters. We’ve been doing something similar with the activity list in SuperOffice since version 5 — very handy way of managing large lists of information. This new button-oriented search interface fixes the big problem with the old interface: the little dropdown menu that the magnifying-glass triggered was too small and too annoying to be bothered to use. The new interface works much better: the buttons afford experimentation, and the filtering stuff is pretty obvious. The buttons on the right of the split are different: they determine which field you are searching on, and this isn’t quite obvious unless you have a couple of hits in the list. Getting an empty list up after you click a button is baffling. Putting a little text up to explain why the list is empty would help a lot: “No albums named ‘Cherry’ found”. User interfaces seem to proceed through stages, no matter what technology is involved. First the new must mimic the old, before breaking away and exploring the outer limits of the design space, then finally settling on conventions and becoming mundane before the cycle repeats again. The first cars are horseless buggies, with reins instead of steering wheels. Reins give way to various levers/stick/wheel systems, before finally settling down to the system we are familiar with today. Software CD players started out mirroring the physical CD players in the real world – down to the little LED displays and buttons of the real, physical thing. After a while the designers realize that the old constraints no longer apply, and a slew of new interfaces burst forth, all challenging the old ways of doing things. During this phase we got things like winamp v3 skins, Microsoft Media Player version 9 and 10, which paint pretty pictures, but which didn’t really challenge the fundamental play/next/prev/stop model the software cribbed from the old physical CD and cassette decks. iTunes was probably one of the first to leverage the advantage of having a screen and a keyboard attached to the player. Suddenly you could see next song in the list on the screen. You didn’t have to create playlists ahead of time — the whole archive was there to manipulate in real time. Software music players are still exploring the design space — and they have finally broken away from the old physical boombox. The reason I bring this up is that we have got new phones at work. IP Phones. Internet telephony. Shiny. New. You must have a program running on your PC in order for the phone to work. This program is the users interface with the phone network. This program is a prime example of the tyrrany of the real. 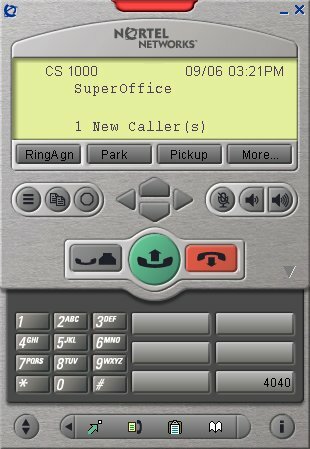 This program uses a scan of a real phone for its main window. But Nortel is the craptastic software I have to use on a daily basis. There is a voicemail system in there as well, with the corresponding voice-driven menu system. Why does the menu system have to be on the phone? I’m sitting in front of a large color display with plenty of room for a list of messages in my mailbox. Do I have to listen to a women wibble on about the number of messages? IP Telephony is still in the horse and buggy stage. We can only wait for the winamp/skinning phase to start soon, as useful but incomprehensible interfaces start to appear. The fact that SIP and the underlying APIs are fairly open means that there should be lots of experimentation as the infrastructure starts to become deployed. Finally finished Brothers in Arms: Road to Hill 30 – interesting and nicely balanced length and difficulty. The quick interface for giving your squad commands works well: point at a target and click the right mouse button, and the context determines the command given. The biggest problem is that the click is modal — you have two teams to command, and which team gets the order depends on which team you have selected in the lower left corner of the screen. Unfortunately I can’t see a better way to do the command targeting without adding another button to the mouse. It would be nice if the current selection was a little bigger than the tiny icon in the corner. The command system is almost too simple, since there are only two verbs: “go” and “shoot”. Still, when the bullets are flying it’s easy to give the wrong command. The game gives you lots of interesting puzzles to apply your commands to. Early battles are tutorials, with handy fences and walls for you to hide your flanking maneuvers. Each fight becomes a simple chess game: fire team to that fence, fire to supress, move assault team to flank, fire to finish enemy position, move up to next obstacle, repeat. Later battles are a lot more open and free-form, where your tactics and eye for positioning become the deciding factor. Flanks aren’t as obvious. They also require the occasional headlong rush to solve. Interlocking fields of fire makes flanking impossible without taking casualties. This isn’t as much a chess game as Full Spectrum Warrior. Especially in later battles, where the enemy AI tries to flank you while you are doing your thing. The narrative is thin but realistic — the squad leader voice-over mumbles on about the friendships and the horrors of war. The missions all fit together nicely (i.e. take a town, then defend it against the counter-attack), but the characters in your squad remain cardboard cut-outs for the most part.